#BookishSpinsters | Equality in Sport. Today I am here with my post for Bookish Spinsters! Bookish Spinsters was created by Joanne at OnceUponABookCase where every week a different feminist topic is chosen to be discussed! The posts actually go up on Fridays but as this is my first one I really wanted to get this one right. For more info on Bookish Spinsters you can find it HERE! Onto this week’s topic which is equality in sport. So, fun fact for you all, I used to be heavily into sport throughout my school years. I thought I was pretty good at football and basketball, at least. On the estate where my cousin lived, there was a massive green cage the size of a small football pitch that we would play in, whenever I was there. Is it surprising that I would often be the only girl playing? Because gender norms and all!!!! It’s a BOY’S game!!!! I was often labelled a “tomboy” because I didn’t like wearing dresses/skirts and I liked playing football. But I never, no matter who I was playing with, felt like I treated the same as any of the other players. If I fucked up, I got it worse than any of the others did. I feel like they only seemed to care when I actually scored a goal or something. When I was actually given the chance, that is. Eventually, I think it got too much for me and I just stopped caring. Even when I went to an all girls secondary school, I stopped caring about it. I still watch some football when it’s on, I still support West Ham United and I’ll watch the Wimbledon finals but that’s all, really. It’s as if I was pushed out of it just because I was a girl. I don’t know if it’s any better nowadays but I guess that’s what I get for not always conforming to gender norms!!!!! I never really sat down and thought about gender equality in sport, if I’m honest. Which is super bad because after looking into it, it’s so stupidly clear how unbalanced gender is in sport. It’s a very male dominated industry. When you turn on Sky Sports and you see football, golf, basketball who are playing? Men. The only mainstream sport that seems to publicize female sports stars is tennis. I really hope this doesn’t come across as dismissing their achievements because it shows that hard work does pay off. And there are plenty of great role models for males who like sports. But only a handful for females who like sports. 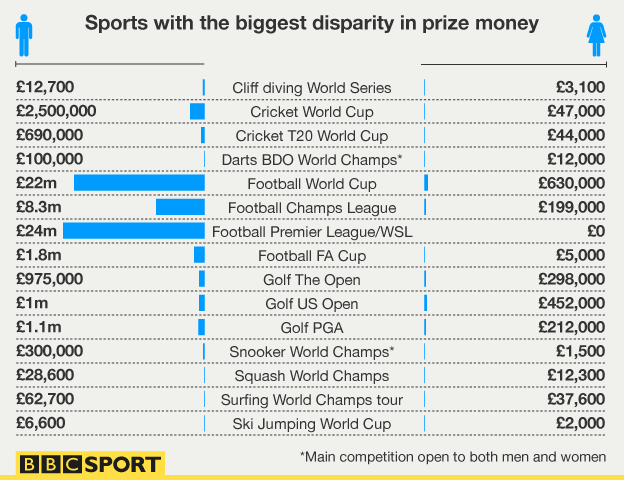 There is also an awfully large wage gap between men and women in sport. I found this article on the BBC – http://www.bbc.co.uk/sport/0/football/29744400. I don’t know how accurate this is for right now as the article was posted in October 2014. BUT LOOK AT THIS GRAPHIC. If this is for competitions, can you imagine how much women aren’t getting for doing the same! blooming! job!!!!!! I can’t believe how ignorant I’ve been about this. I’m all for wanting equality in the work place but I think it’s so easy to forget that playing a sport is a livelihood for some people. There has to be more representation of women across all borders. More broadcasting leads to more money being invested in women’s talents in sport. Which can lead to shortening this stupid gap for doing the same job. And to show young girls that it really is possible to work hard in a man’s world. Next Next post: November Wrap Up 2015!